Like everybody else in the entertainment journalism racket, I spent much of this afternoon trying to think of Heath Ledger anecdotes, trying to be one of those obnoxious people -- Tom O'Neil, I'm looking at you -- who attempt to fabricate a cause for a 28-year-old man's death out of a five minute interview I did at some junket, an interview that was probably #137 out of #673 for the day on his schedule. It turns out that I couldn't do it. I only interviewed Ledger once, back in the summer of 2005 as part of a small roundtable for Terry Gilliam's miscalculated "The Brothers Grimm." Paired with Matt Damon for the interview, Ledger was nearly silent. Damon was the polished showman, the Journalist's Actor, always handy with a quote and a smart rejoinder. Ledger was more of a grunter, giving quick and terse answers. When some actors do that, you think they're rude, that they're better than the dog-and-pony-show process. With Ledger, the only impression we got was that he didn't like talking about himself or about his craft because he just wasn't sure what to say. It was three months before the "Brokeback Mountain" buzz had really begun and somebody asked him about the movie and he was genuinely unsure how it was going to play. He was confident that the work had been worthwhile, but not willing to play premature pundit and start raving. He was only an actor, not a self-publicist. It's too early to know for sure what took Ledger's life, though the media was sure quick to jump to "SUICIDE!!!!" speculation. That's just what we do, I guess. And I guess I can't blame the utterly asinine and unqualified arm chair shrinks who went on CNN and gave out-of-context Ledger quotes about how playing the Joker in "The Dark Knight" left him with difficulties sleeping. Tom O'Neil thought he seemed antsy?!?!? Print it. Geez. Anyway, I'll let the vultures discuss things they aren't credentialed to discuss. After the bump, I have a few quotes from my own reviews on Ledger's performances, some excellent, some misguided, never boring. To my mind, Heath Ledger was a character actor trapped in a leading man's body. He was like Alec Baldwin in that respect and may have eventually had a similar sort of career arc. Hollywood wanted him to put on armor and win the girl, like in "A Knight's Tale," or to take his place alongside Mel Gibson in "The Patriot." If you look at his studio star turns, though, the only time he was ever 100% comfortable was in "10 Things I Hate About You," a film and performance of effortless charm and dexterity that probably won't get mentioned enough in the days to come. But if he didn't seem like he wanted to be the A-lister toplining "The Four Feathers" or "The Order," he was always able to step into the background and be fourth of fifth billed, but far more interesting, in films like "Monster's Ball." My first year on the Zap2it movie beat was 2005, a year that saw four very different Ledger performances. On "Lords of Dogtown" : "The film's most striking performances come from Rebecca DeMornay and Heath Ledger. DeMornay, stripped of makeup and actorly ego as Jay's loving, but somewhat daffy Beach Betty mom, is so sympathetic and stabilizing that the film suffers when she's off-screen for extended periods. The same is true of Ledger, who vanishes entirely into Skip's facial hair, teeth and surfer dude speech patterns, delivering the finest Val Kilmer performance the "Top Gun" star never gave." On "The Brothers Grimm" : "As he did in "Lords of Dogtown" earlier this summer, Ledger finds a previously hidden vein of Val Kilmer, creating a character from wisps of facial hair, funny glasses, a silly accent and an assortment of wild gestures borrowed, it seems, from the film's director. He's very funny, but in taking the comic path, he cheapens the character's credulity, which should be the heart of the film." 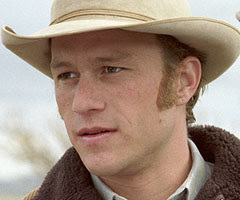 On "Brokeback Mountain" : Ledger is truly the film's star, even thought Ennis is as introverted and socially awkward a man as you'll ever meet. Ennis can't really speak or relate to either men or women and as much as desire leads him to Jack, he's equally drawn by the fact that with this other man, he can occasionally smile and joke and let down his guard, step away from the pressure of trying to be the solitary and silent Marlboro man. That Ledger gives Ennis a voice that sounds like the drawling amalgamation of countless Western heroes is intentional. He's trying to be John Wayne on the surface, even if the outside world and his own inner needs clash with that image. In one role after another this year, Ledger has campaigned to avoid movie star status and just be respected as an actor, but this is the first time his promise is fulfilled. On "Casanova" : For his part, Ledger is superficially charming and little more. This is exactly the kind of generic pretty boy part that he attempted to move away from after "A Knight's Tale." It's enough that he looks the part, because he delivers every line with the same bemused detachment. The only film in which he was truly bad was "Casanova," which must have seemed like the most commercial of the projects. But Ledger was learning. From what we've seen, his Joker in "The Dark Knight" looked unbearably creepy and psychotic and he was finishing another film with Terry Gilliam which -- let's face it -- might not have been any good, but it probably wouldn't have been boring. We'll miss out on the evolution of an actor who wanted to grow. That's sad. His performance in Brokeback Mountain touched me so much that when I think about the movie sometimes I forget that Jake Gyllenhaal was even in it. All I usually remember is the shell of a man that Ennis became and how Ledger portrayed that without any words. Truly outstanding, heartbreaking work. I also love that you mentioned 10 Things I Hate About You, one of my favorite little films of that strange late 90's teen comedy boom. He's incredibly charming in that role. I was just vaguely outraged by the entertainment journalists being called in as psychological experts to explain why this guy may have killed himself without anybody knowing a darned thing about the actual facts of the case -- hence the hour-long "It was Mary-Kate's apartment!" fiasco -- or about the true psychological condition of the man in question. I mean, I don't question Tom O'Neil's credentials as an awards guru, but he's neither a trained medical examiner nor Dr. Phil nor a friend of Ledger's, so bringing in the guy to speculate on cause of death, reason of death or Ledger's state-of-mind is mighty sad. A touching, fitting tribute to a too-brief career. Heath, we hardly knew you. RIP. He will be missed. My wife asked who he was and I told her that she had just watched a couple of movies he was in: A Knight's Tale, The Patriot. She still did not realize which actor he was. That is why he was so good. He could deliver a smashing portrail as he did as a Knight, and yet he blended right in with the rest of the actors. That is what made him so good that others of lesser talent were made to look good.